Bohemian fashion has definitely come into style over the past few years. This type of fashion is so trendy and so much fun to wear. 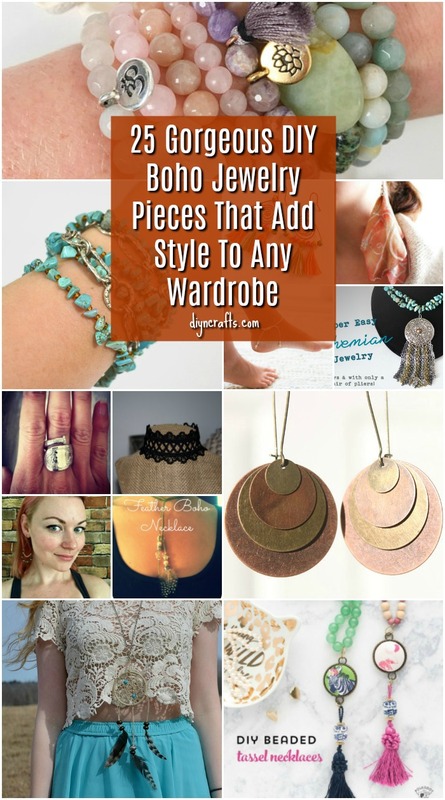 If you love the boho style, you are going to adore this list of 25 gorgeous DIY boho jewelry pieces. You can make so many of these in just an hour or less and many of them use upcycled or repurposed materials so they’re pretty cheap to DIY. 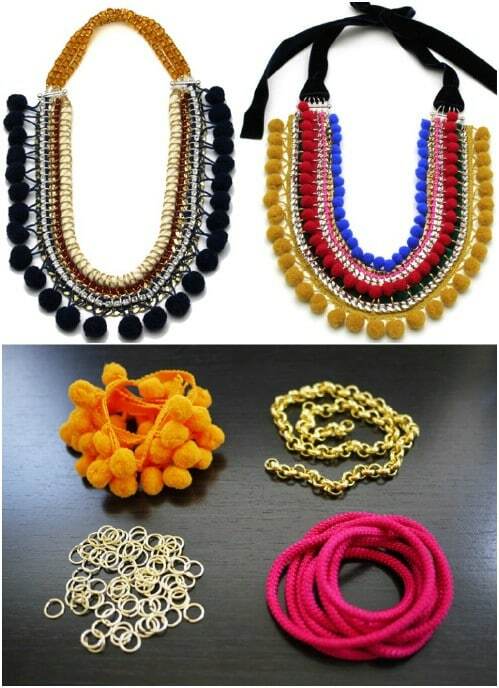 From anklets and bracelets to necklaces and chokers, you are sure to find the bohemian themed jewelry pieces that you need to match any attire. 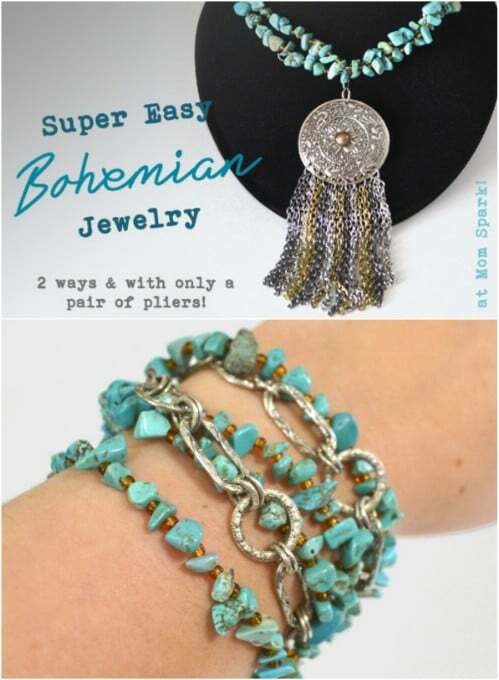 Beads, leather, feathers and tassels make up the gist of this boho jewelry collection and they are all gorgeous pieces that are so simple to DIY. By the way, if you truly love the boho style then you just have to check out these 20 DIY boho décor ideas to add that fashionable look throughout your home. I love making my own jewelry and these boho pieces are among my favorites. You can wear these for work or for play – they’re very versatile and they all make the most wonderful gifts. 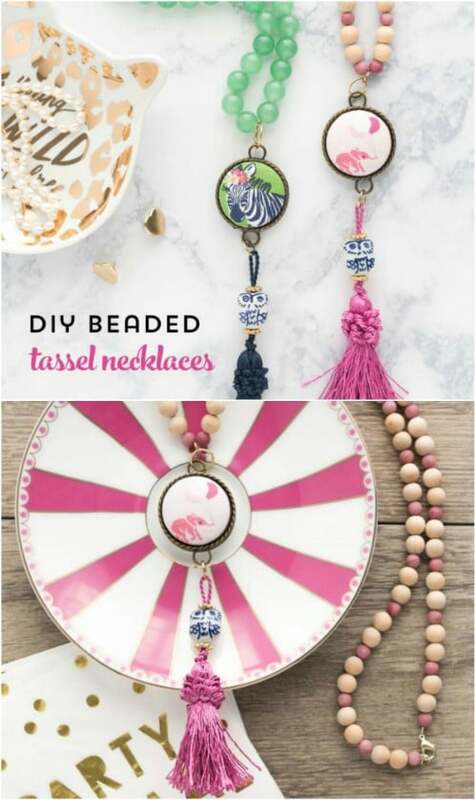 If you know someone who loves boho fashion as much as you do, be sure to find them a great DIY boho jewelry gift in this list. They’ll love it as much as you do. And, be sure to take a look at these 35 vibrant DIY jewelry pieces to dress up your summer wardrobe. There is something in here for everyone, no matter what your personal style preference. This little anklet sports shells and beads so it is perfect for the beach or anywhere you want to wear it this summer. It’s also a great boho inspired accessory and it’s pretty easy to make. If you have made your own jewelry before, this one will be a cinch. 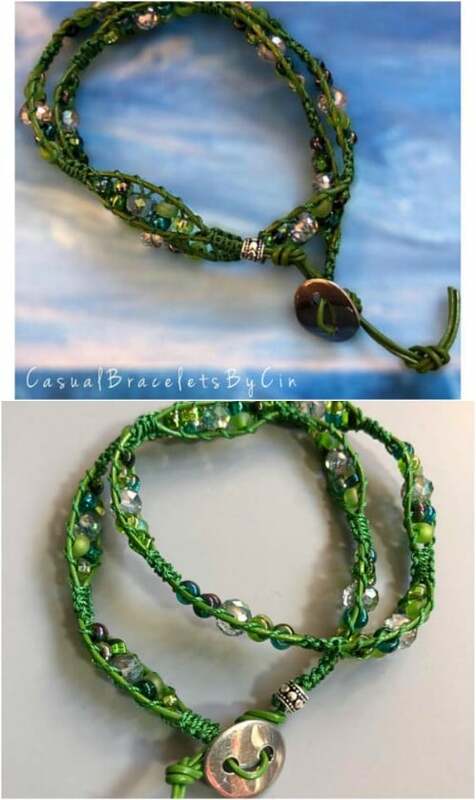 Just add beads and shells to hemp or jewelry wire to create the look. Check this one out that I found on Etsy for inspiration – or you can pick this one up for less than $20. These DIY beaded tassel necklaces are definitely boho and they are super easy to make. What’s great about these is you can customize them in any color and with any image that you want – I do love the zebra one. You can find all your needed jewelry making supplies at any craft or hobby store and these are pretty cheap to make, too. They make wonderful gifts for anyone else you know who is into the boho style. Just a few strips of leather and some beads are all you need to make this amazing leather wrap bracelet. These are pretty simple bracelets to make and don’t take long at all once you get the hang of it. I found this one on Etsy and you can get it for under $30. There are a number of styles and colors available. If you choose to make this one yourself, you can get all of the supplies at any craft store like Hobby Lobby. If you have a thin one, this would be a great way to repurpose old leather belts, too. There may look like a lot of supplies to make this DIY boho chain necklace, but it’s definitely worth it. This is a lovely double stranded chain necklace that has beads, pendants and so much more going on. You can get all of your necklace making supplies online or at any craft or hobby store – Walmart has them, too. This is a pretty simple one to make once you have all of the materials and it will definitely make a statement when you wear it. These DIY boho earrings will literally only take you about five minutes to complete. These are perfect for upcycling leftover fabric scraps. You just need a small bit of fabric for each one, as well as earring hooks, cones, beads and a few other jewelry making supplies. These are simply gorgeous and you can do a pair in different fabrics so that you always have something to match your current attire. 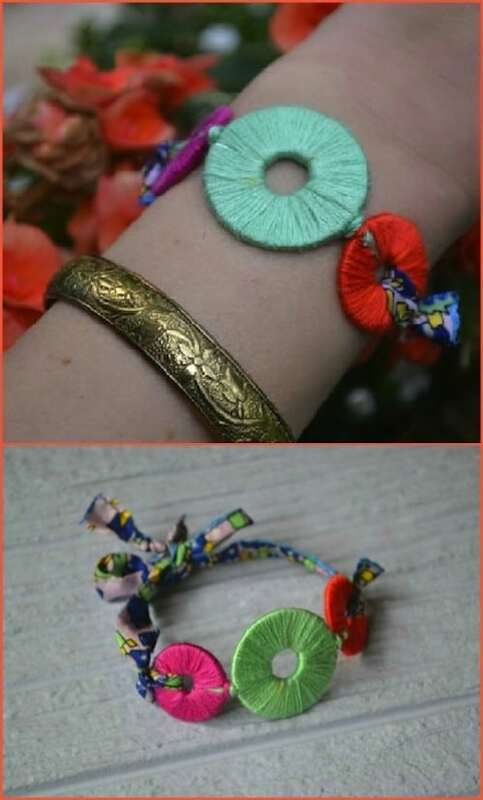 This bohemian style bracelet is a really easy DIY and it produces the most gorgeous bracelet. You make this with chains, wood beads and other jewelry making supplies and it’s about as unique as you can get. It’s pretty simple to make though, if you have just a bit of jewelry making experience and you can pick up all of your supplies at any craft store or Walmart. 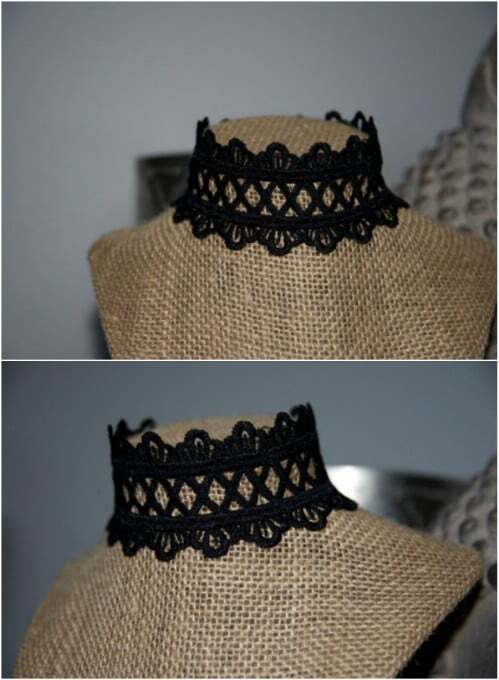 I absolutely adore this boho style crocheted lace choker. This would be such an easy DIY project, even if you don’t normally crochet much. You could change up the stitches a bit to make it more unique, or do one in a number of different colors and use different stitches for each one. It’s a great way to get in some crocheting practice. I found this particular choker on Etsy and it’s just $13 and comes with an extender chain to guarantee the perfect fit. Add this one to your list of crochet gifts you can make today. 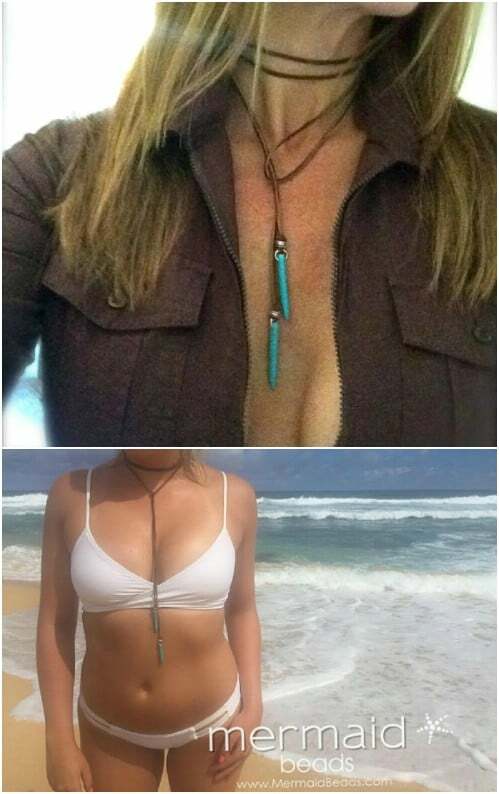 Dream catchers are great on their own but when you add them to bohemian styled jewelry, you get something so unique that you will want to show it off. 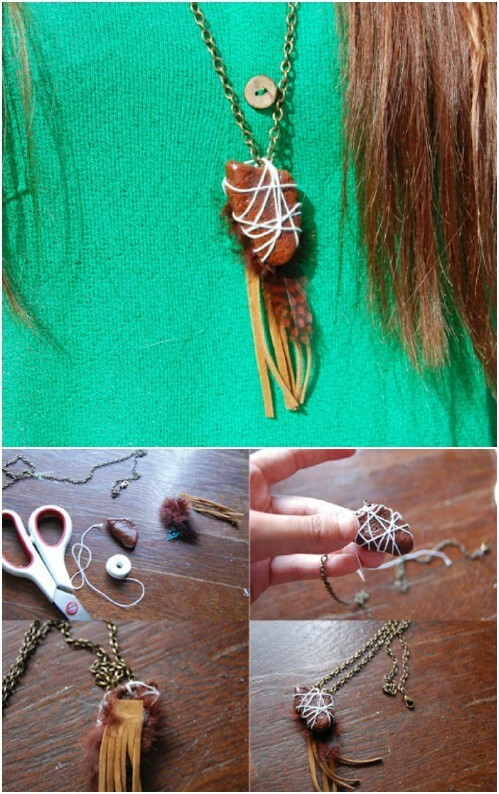 This boho dream catcher necklace is super easy to make and so lovely when it is finished. You even make your own mini dream catcher for this one, so it’s completely DIY and it costs very little to make, especially if you have a jewelry making kit on hand already. 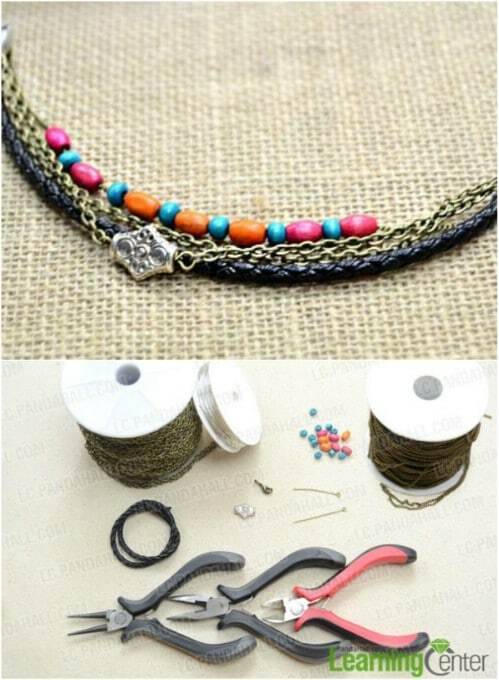 This beautiful DIY bohemian styled metal tassel pendant necklace takes very little time to make. 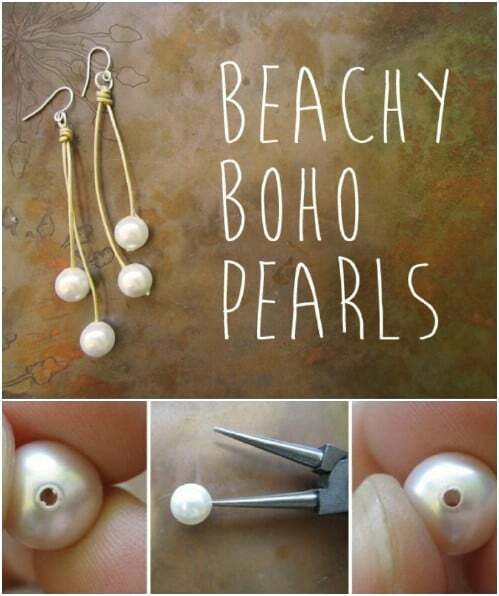 It’s so easy and you only need a pair of pliers and your jewelry making supplies to create it. This one has a metal pendant complete with little metal tassels hanging down. You could do this one in any color by just changing the color of your beads. It’s a great one to make in bulk – just do one in every imaginable color! I love how simple these DIY double tiered earrings are to make. Even if you don’t normally make your own jewelry, you can have these finished in about half an hour or less. It’s also really simple to customize these by just changing the colors or the types of beads that you use. You could do several pair in a couple of hours and have a nice set of boho styled earrings for every outfit that you own. This thin leather choker is perhaps the simplest DIY boho jewelry that you could make and this one definitely makes a statement. 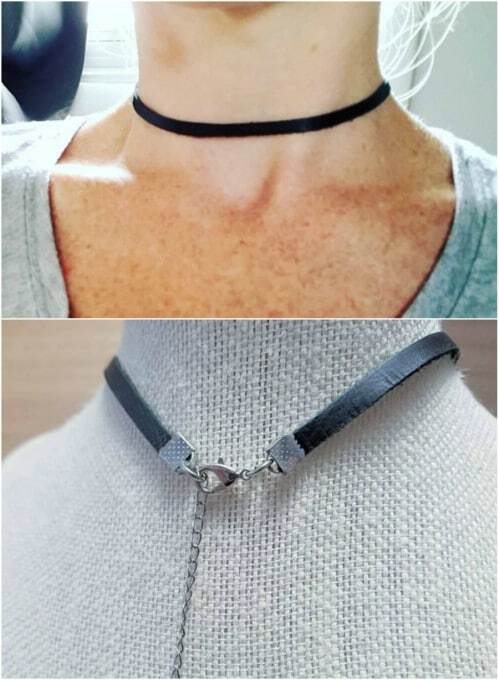 This is a gorgeous leather choker that you could have done in just a few minutes. You just need a thin strip of leather and a necklace closing kit – or you could just add ties to the leather to close it. I found this one on Etsy. It has an adjustable lobster claw closure and you can grab it for just $8.50. 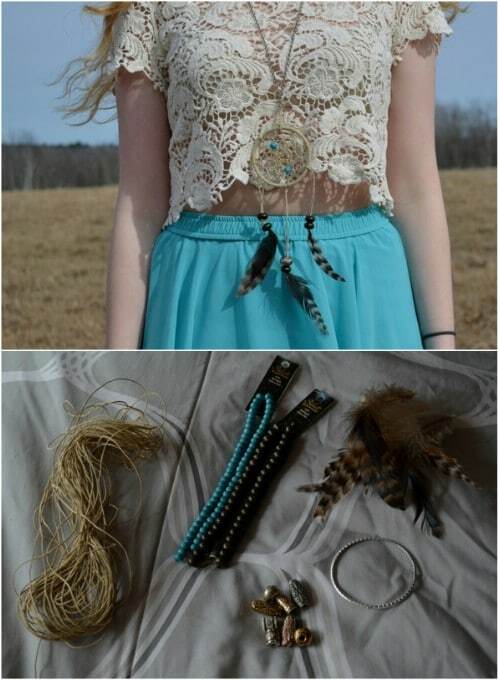 Feathers are huge in bohemian fashion and this DIY feather boho necklace fits in perfectly. 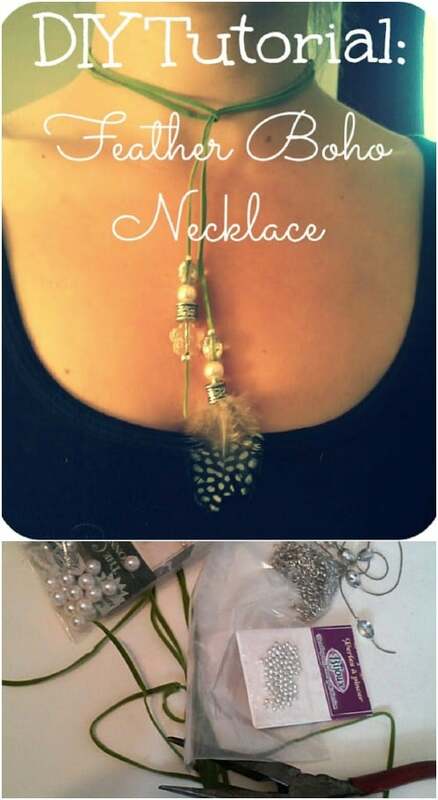 This is a super easy one to make and you can customize it with different colored beads and feathers. You can get the supplies for this one online or at any hobby store. The necklace chain is a thin strip of leather, where the beads and feathers lay. It’s a gorgeous piece that won’t take you longer than just a few minutes to DIY. This DIY fringe necklace looks much more complicated to make than it actually is. You can do this any number of ways to make it unique, so you could have a fringe necklace to match all of your outfits. 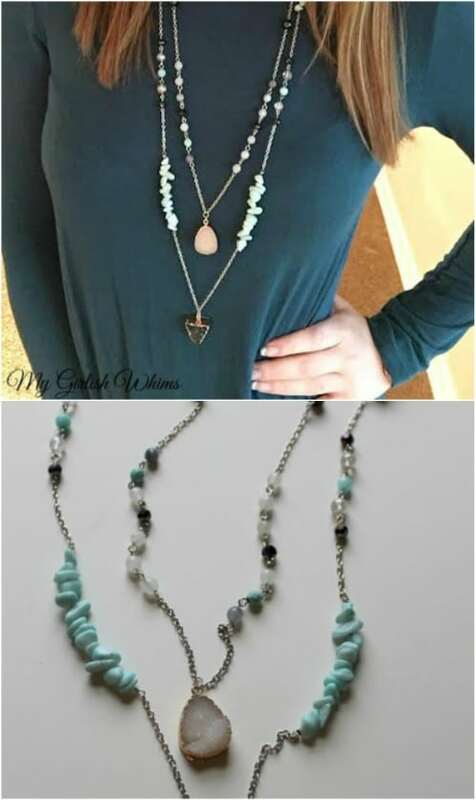 You make these with statement necklaces, which you can get at any thrift store or the Dollar Tree. Also, Walmart normally has them on clearance and they’re really cheap. Then, you just add your fringe and you’re all done. These dangling earrings are gorgeous and you can do them in any number of colors or color combinations that you want. 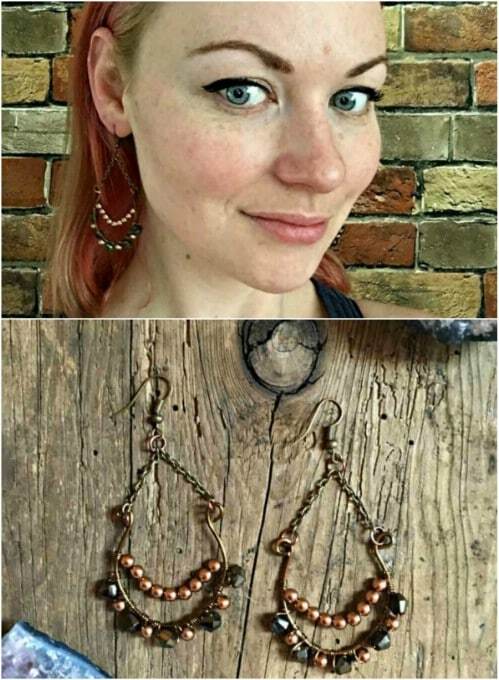 They’re super easy to make and if you use existing copper earring bases, you can have them finished in just a few minutes. 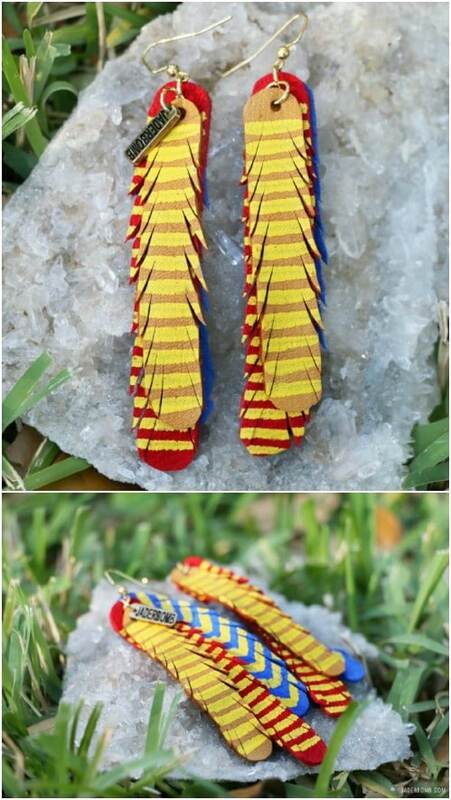 The tassels are made with embroidery floss and there are so many colors available. These would make gorgeous gifts for anyone you know who loves eclectic jewelry! You could even make them a decorative hanging jewelry organizer to go along with it. 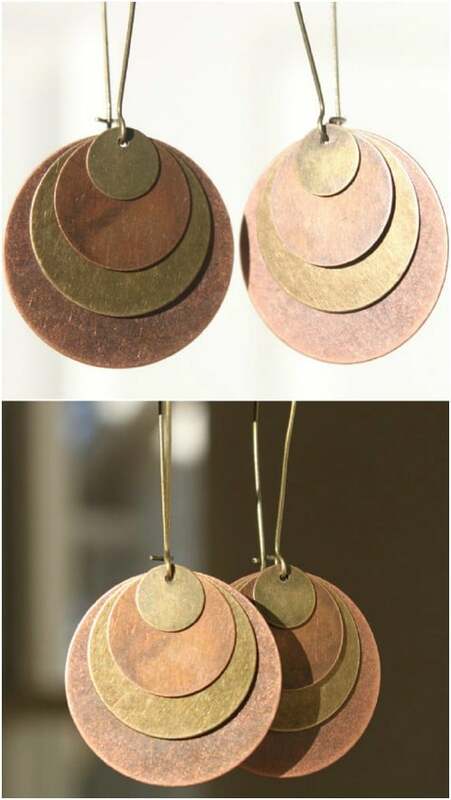 If you love dangling earrings, you are going to adore these large brass disc earrings. They have four brass discs per earring that are layered on top of one another. These would be super simple to make. You just need your earring base and the brass discs in different sizes, which you can pick up at any craft store or anywhere that sells DIY jewelry supplies. Or, just take a look at these that I found on Etsy for under $25. Leather is a popular material in boho jewelry. These DIY leather earrings are easy to make and perfect for your bohemian style. You use earring fish hooks, jump rings and leather lace cord to make these, along with beads, charms or other embellishments. They are pretty simple to make and won’t take you longer than an hour for both. These are great because whether you like silver or gold, you can customize them to your preference. 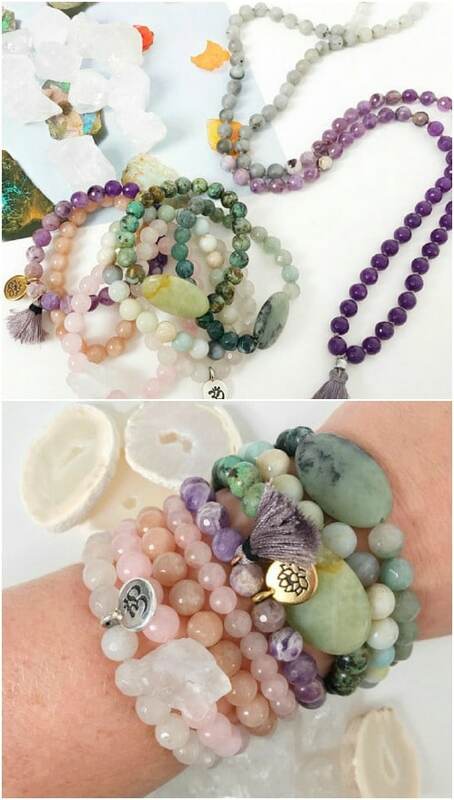 I love these stack bracelets that are decked out with various healing crystals. You can get the plain silver bracelets and the crystals at any craft or hobby store. These are super simple to make and so lovely when you wear a few at a time. You could also check these out that I found on Etsy. You get to choose your size and your crystal and they’re just around $15 each, depending on the size. Leather is such a staple for bohemian jewelry. That being said, these DIY painted leather cuffs are super easy and fun to make and they add a gorgeous touch to any attire. You can do these in so many different colors and designs and there are a few different methods for the painting. Try freehand painting or use paint stamps. You can also embellish them with rivets and other leather working materials. These pearl earrings are very beach inspired and they are perfect for casual or formal wear. You make these with standard earring jump rings and some faux pearls – or you could use real pearls if you want them to be really fancy. Add some Swarovski crystals and other embellishments to make them as unique as you want. The pearls hang from really thin leather cord. This statement necklace certainly makes a statement and it’s a pretty easy one to make. You start with a chain and then add pom poms and any number of other embellishments. You can make the pom poms yourself or just get some pom pom trim to make it easier. Add nylon cord and some jump rings and this one won’t take you long at all to make. It’s a stunning fashion statement in true bohemian style! If you’re old enough, like me, you may remember these lovely spoon rings from days gone by. I loved mine and although it’s been gone for years now, I have always thought about getting another one. This DIY spoon ring is perfect! It’s super easy to make and has that traditional spoon ring look and charm that pairs perfectly with your other bohemian fashion pieces. 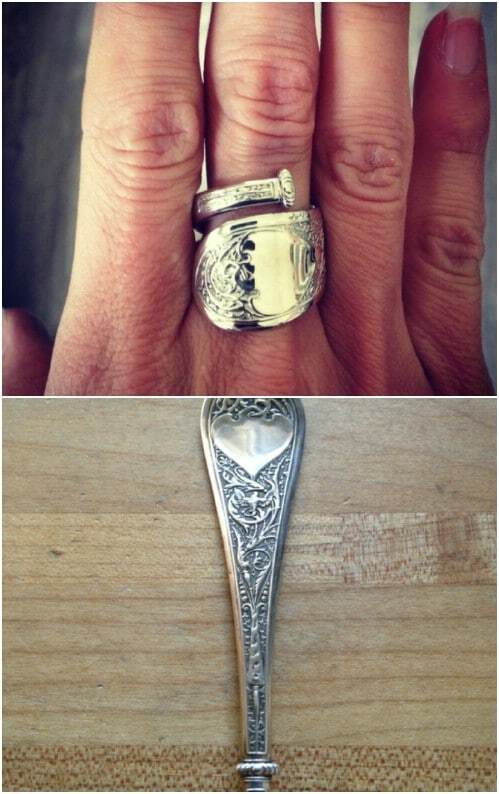 This is a great way to repurpose old silverware! If your spoons are tarnished, you may want to get your silverware sparking clean before you make the ring. This DIY stone necklace is in true boho jewelry style and it is gorgeous when you get it finished. For this one, you’ll need quite a few supplies such as a small feather or two, a stone, a chain, some sturdy thread, small pieces of leather and a few other materials. This is a lovely statement piece that is sure to get some attention, and you can tell them that you made it yourself! Use some old metal washers to make this stunning bracelet. You just cover the washers with colorful embroidery thread, which gives them a beautiful look. 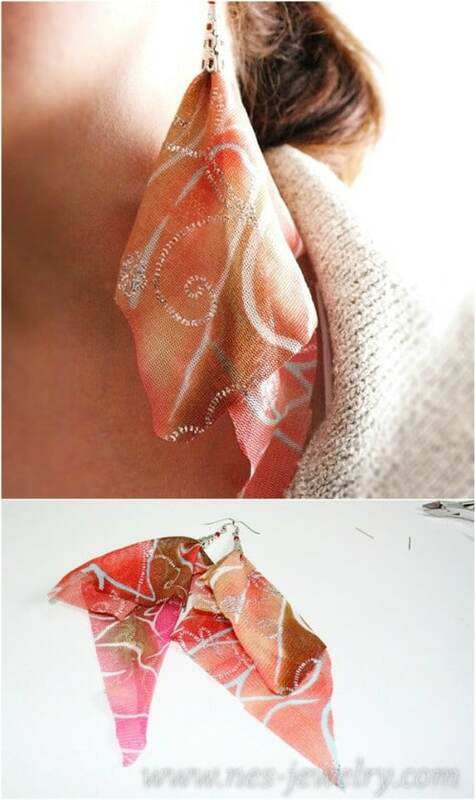 The rest of the bracelet is made with fabric, which makes this a great project to upcycle those fabric scraps. You don’t need much fabric at all. These are so easy that your little ones can help to make them and they make wonderful gifts. A strip of leather and some gorgeous turquois spikes are all you need to make this beautiful statement necklace. This one is easily customizable, too. You could make it as long or as short as you want it and add beads of different colors to make it really stand out. I found this one on Etsy and it’s just over $20, and you get to choose the bead colors that rest above the turquois spikes as well as the leather color. 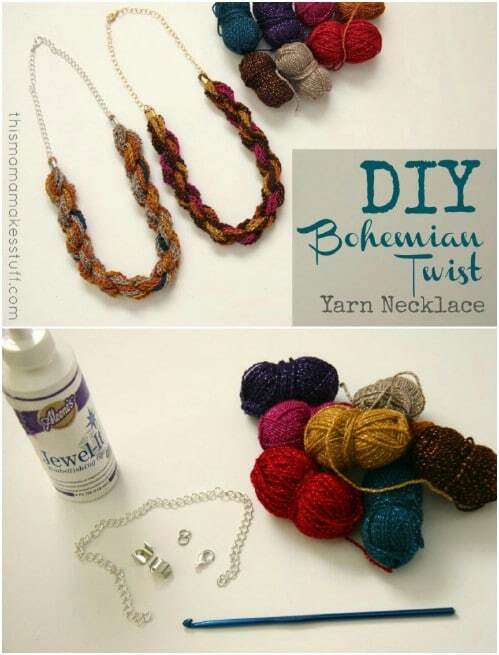 I absolutely adore this DIY twisted yarn statement necklace, and boy does it ever make a statement! This one is a bit more complex but not at all difficult. It does take a little time to twist the yarn but the great thing is that you can choose whatever colors of yarn you need to match your favorite outfit. You can even use this project as a means of upcycling scrap yarn and aside from the yarn, you only need a few more supplies to make this one.